A great way to have fun with fashion is to mix and match contrasting prints! It's one way to stand out and make a fashion statement too. 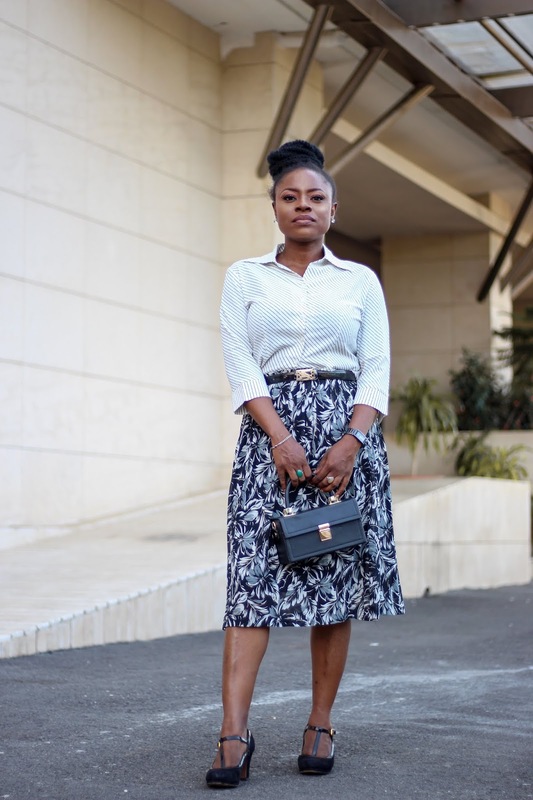 However, mixing prints if not done right, can look horribly wrong but then again style is personal so that might be subjective. 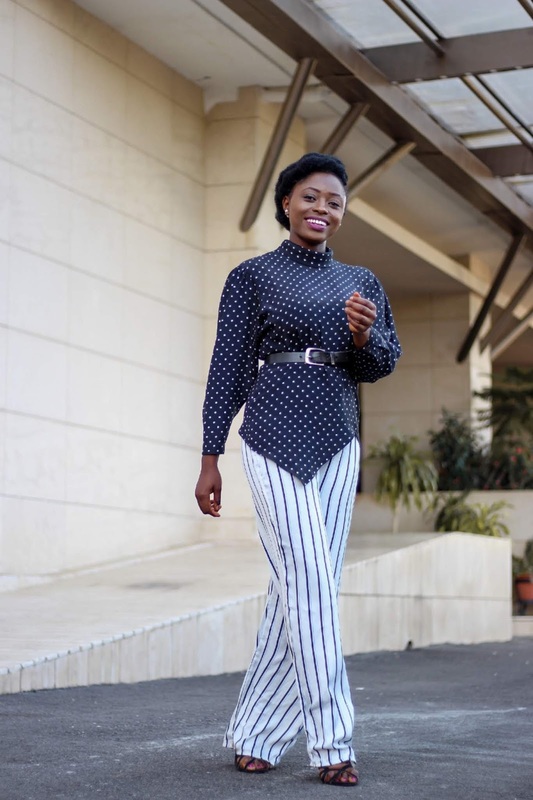 Anyways I thought to bring in Abuja based blogger, Opeyemis Diary to show you guys how we style mixed prints. 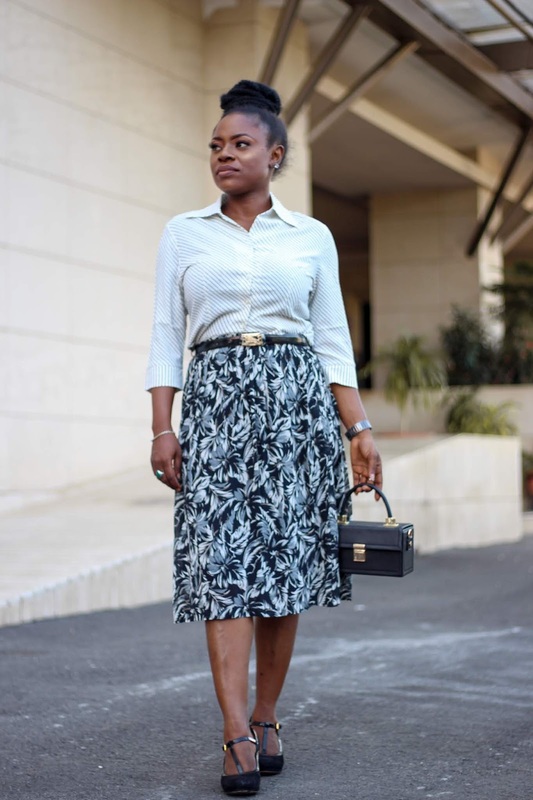 What I love about Opeyemi's style and blog is first of all how modest she is and yall know where I stand on this. I also love how she works ankara and supports our Made in Nigeria brands. We had so much fun and laughs shooting these pictures, it was actually quite hard choosing serious pictures. I've never met anyone who laughs as much as she does. I actually have a rant about our shoot day in the end though but let's talk about how we mix prints. We both kept it basic by going with a monochrome black and white colour scheme and also both incorporated stripes. 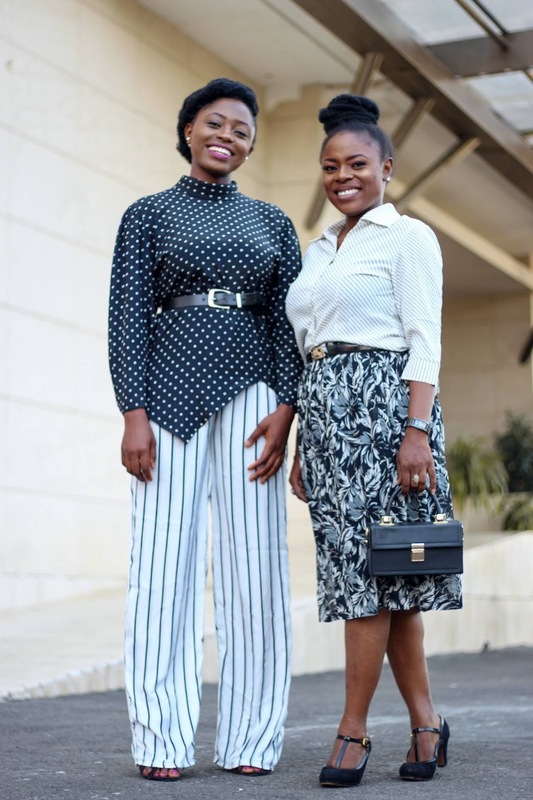 While I paired my striped high waist trousers with this polka-dot top, Opeyemi opted for a floral midi skirt for her striped top. 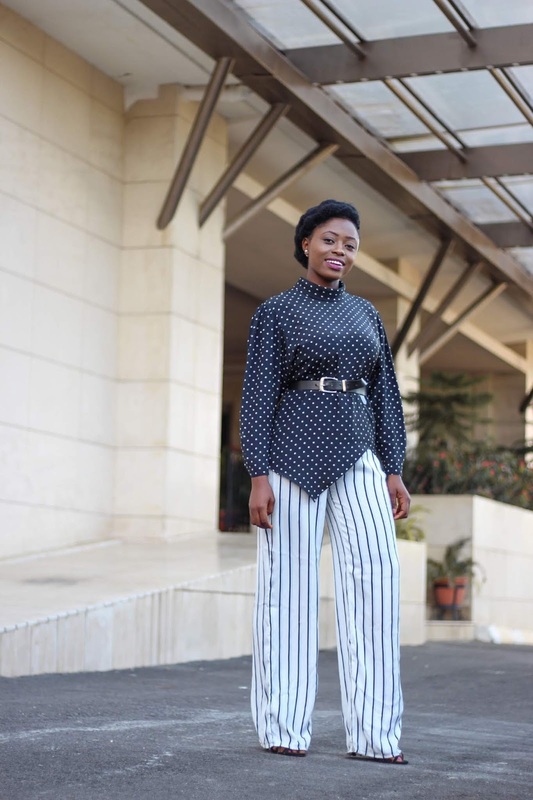 My top was thrifted at Nyanya Market for N400 (see places to thrift in Abuja) and I previously styled it with a polka-dot skirt as a dress in this look. This time around, I really wanted to show the beautiful cut of the top. 1. 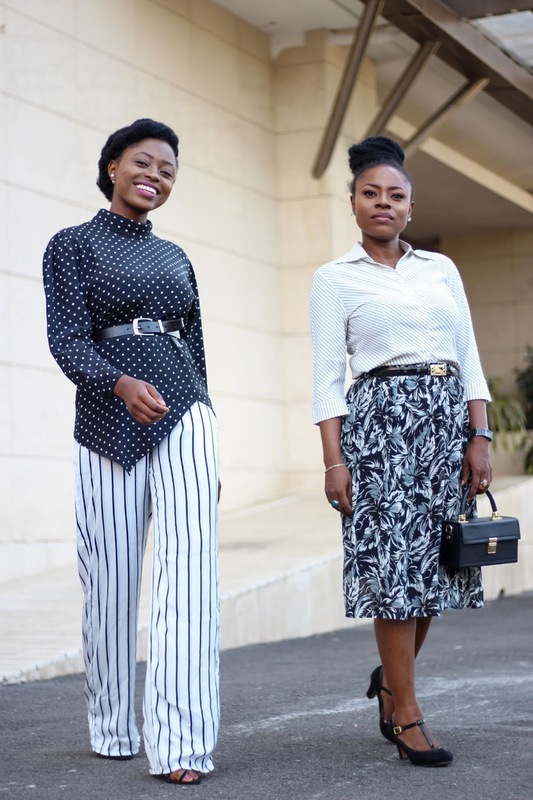 Keep it simple: Opt for neutral colour palettes like black and white when pairing prints, you really can't go wrong with this no matter what print you mix. 2. 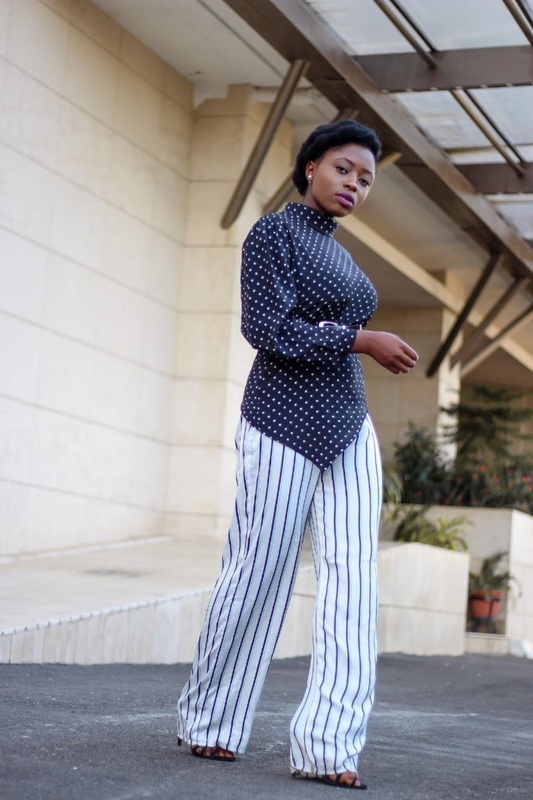 Stick to similar patterns: For example, one can wear polka-dots on polka-dots but perhaps in different colours or sizes. 3. A mutual colour: When mixing and matching contrasting prints, make sure each pattern has a colour in common. 4. Stripes are you best bet, they go with everything! 5. Try something new: Don't be scared to add a pop of colour or even mix random prints, you never know what will work until you try, just have fun. 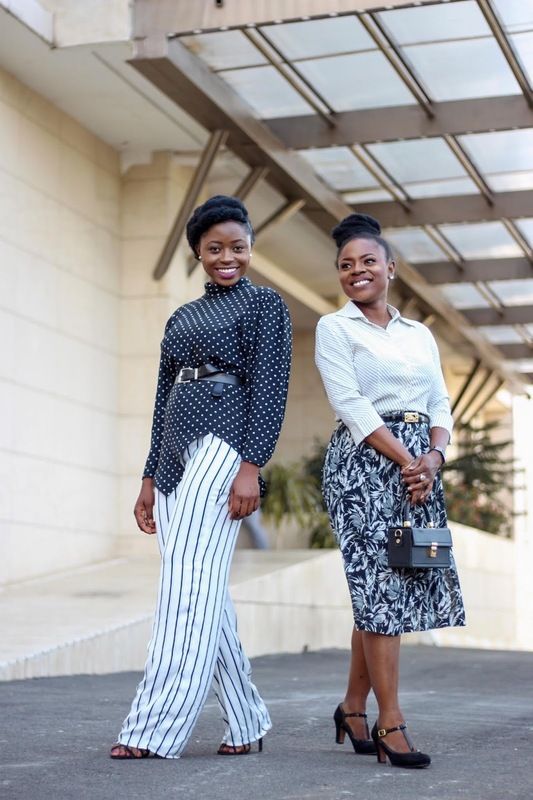 We actually took these pictures at Dune Abuja where we were almost kicked out. First a little backstory, I've taken pictures at Dunes several times and have never had any issues in the past. Unlike other public malls in Nigeria where the security guards block you and tell you pictures are not allowed, these people don't bother or stress one, they just look at you. In fact, there was this one shoot I had that I changed three times in their bathrooms and even took two outfits there for about an hour or so and no one told me nothing. Thus I suggested we shoot here but can you imagine after about 15-20 mins of shooting, we were approached by a mumu security guard who suggested that we leave, that the cameras were watching and we had stayed for too long lol. Mind you I've never had issues before and I was so sure the rules had not changed. 1. Everything happens for a reason, had we not hit that car we wouldn't have been able to finish using that location to shoot and we probably would never come back to shoot there, thus losing a good stress-free spot to take blog pictures. We would have also wasted time moving to a new location. Also while shooting at Dunes, we discovered new spots in the area so yass! 2. God's going to put all those who oppose you to shame. Look what happened to that security guard lol. You might think oh it's just a blog shoot, but I want you to think about how we go throw similar situations in life. 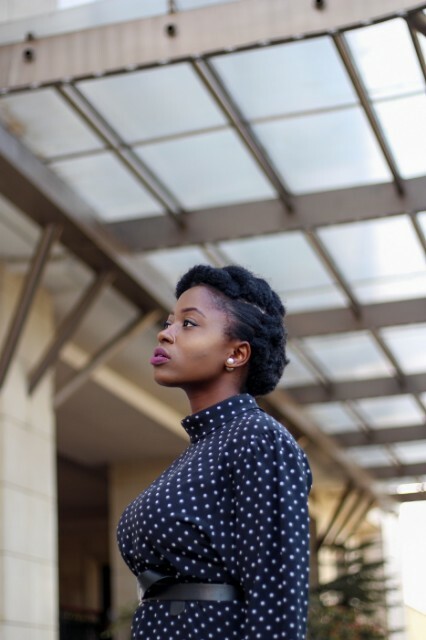 Back to the collab, be sure to stop by Opeyemis Diary to read her take on how she mixes prints and catch up on her other awesome posts. We also shot another look so stay tuned for that! We transitioned pieces from day-to-night actually. How do you like to mix prints? Any tips? Bloggers do you have any annoying stories to tell about shoot day in Nigeria? Good to see Ope here. I love her very unconventional style, and yes to your experience re dunes. It is often the overzealous foot soldiers who come up with those ridiculous things! Indeed and yes she does have an unconventional style now that you mention it. Don't mind them, we will continue to win over them. 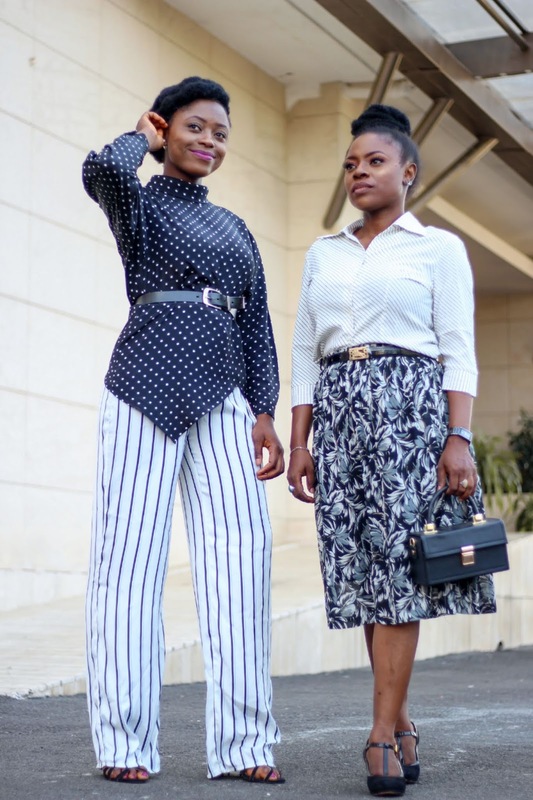 Yes to mixing prints, you guys did it so beautifully, I will dive into this beautiful style. Also I can't believe that they give bloggers so much hassle about taking pictures, I do hope it gets better. Yay Thanks Hun, I hope you do. They actually give us major hassle but it get better everyday. Thank for this collaboration Princess, I enjoyed doing this.